We're half way through July and time is going by so fast I can't cope. I've had an amazing July so far and have just returned to the UK from an amazing week in New York with my mum and sister. 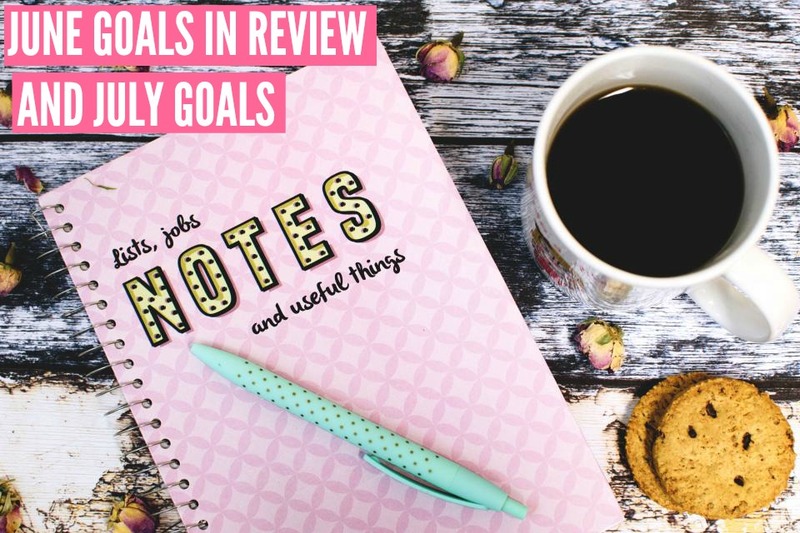 Today it's time to sit down and finally review my goals set for the month of June and share with you all my new goals for the rest of July. Ok so my first goal was to loose half a stone which if I'm being honest it probably didn't happen. I don't really weigh myself but I have been monitoring my eating and making an effort with the gym so I'd say even though I didn't necessarily loose the half a stone I have made small steps in the right direction and I want to continue with this goal in the coming months too. I did achieve goal number two because I had a clear out of the flat. You know when it's not dirty but you feel like it could do with a good clean. One evening I was sat in watching Love Island and I had a sudden urge to go and get the lemon scented wipes out of the drawer and start cleaning and sorting the whole flat. I also got rid of a few pieces of clothing I haven't worn in a while and binned some old nail polishes and bits of crap I had lying around. I think I may make this a monthly goal because it's so relaxing to be living/working in a tidy and clean environment. I have actually been really good with my food prep this month and have been much more creative. I think by switching up my meals for lunch and dinner and having them prepped in advance not only allows me to eat healthier but also I have been going to the gym more often because I have the food prepped in advance which means I just need to reheat it after the gym. I highly recommend food prepping. Apart from this past week I have stuck to my weekly blogging schedule of posting on a Sunday, Wednesday and Friday throughout June and July. I am really proud of myself because I have been having to stay late at work most evenings so when I get home and go to the gym and have tea I never feel like blogging after that but I've stuck to it and it's paid off because my stats have definitely improved too. So as I mentioned above, I have been doing well with the gym and my healthy meal prep so I want to keep continuing with this goal throughout the next couple of months. I have been feeling pretty down about how I look recently and I want that to change so I am going to be tracking what I eat and when I exercise too which I think will really help me. I feel like I've got my schedule sorted now but I want to improve my photography more. I am really toying with saving up for the Olympus Pen epl 7 camera which I have wanted for so long but it's so pricey and I need to save for more important things at the moment like saving for a deposit on a house. I am going to work on improving the photography using my iPhone and be more creative and then see where I get to! I have spent lots of time with family and friends throughout June and July already which has made me so happy and I want to continue with this throughout the rest of July. As I mentioned before and a lot on social media (lol sorry not sorry) I have recently spent a week in New York with my mum, sister and some of her friends who live out there. It was so amazing and I'm looking forward to spending more time with friends next weekend in Sheffield and then some of Jay's family and friends back in a Birmingham to celebrate his birthday!! I go through phases of being scheduling on social media and being really consistent and then having a complete lull and doing nothing. I want to up my game again and get promoting my brand and blog and gaining some new followers and making friends in the blogging community! Did you achieve your June goals? What are your goals for July? Let me know! I'd love some inspiration!! yes, all about meal prep! i've been doing this for months now since starting my new job and cannot believe i ever survived without it. nothing better than getting back from the gym and knowing your food will be delicious and ready in 3 minutes flat!